The BOSS Loop Station range of has some of the most popular looper pedals available today. There is a big difference between the loop pedals in this range, so this guide will compare each pedal and help you decide which one is right for you. If you want to compare the BOSS loop pedals against other options, check out my Guide on Looper Pedals here for alternatives. In this guide, I’ll go through each pedal’s features and explain who each pedal may or may not suit. There are a couple of other pedals in the Loop Station range, but those pedals aren’t relevant for guitarists. They’re designed for vocalists/DJs and don’t use footswitches. This guide will focus on the loop pedals suitable for guitarists. What is a Loop Station? 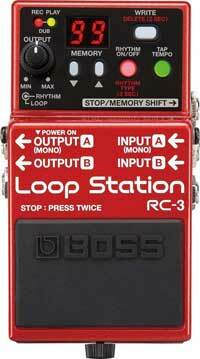 ‘Loop Station’ is the name BOSS give to their looper pedals. A looper pedal allows you to record something on the guitar, then continuously play it back in a loop. Once your loop is playing, you’re able to overdub more parts on top of the loop. There are many uses for looper pedals with one of the most common use for solo guitarists to create a rhythm track to play over in live performances. The below video shows a great example of how a loop pedal can be used to build up complex tracks with one guitar. You’ll also hear other effects pedals create synth-like sounds, which are also added to loop layers. The above video uses a BOSS RC-50, which has been discontinued. But you can still achieve the same results with some of the pedals covered below. Which Loop Station is Best? The best looper pedal depends on what you want from it. If you’re looking for a basic looper that won’t take up much space on your pedalboard, then the RC-1 or RC-3 is probably all you need. You might be surprised by how flexible these small looper pedals are. But if you want to create multiple loops, complex layers, and use other advanced features like what you saw in the above video, one of the more feature-filled loop stations like the RC-30 or RC-300 might suit you better. Features: do you just want to be able to record simple chord progressions to jam over? Or do you want to create full songs on-the-fly for solo performances? Live use: some pedals are easier to use in live performances than others. You probably don’t want to need to bend down to adjust your pedals in a performance. As I go through each of the loop station models, you’ll quickly figure out how each pedal fits with your needs. By the end of this guide, you’ll know which pedal is best suited to you. There is a big difference in features across the loop station pedals. Before we look at each pedal and their unique features, let’s look at the common features available across all loop station pedals. Stereo inputs and outputs: All BOSS Loop Stations support mono or stereo inputs and outputs. This is great if you run a stereo rig, but it can be a great way to experiment with looping different instruments together. For example, you could connect an electric guitar to one input and an electro-acoustic guitar to the other input (or any other instrument). Then you’re able to create loops from either instrument as needed. Even the basic loop station pedals can be used this way. Undo: Imagine you’ve set up the perfect loop and you want to add a melody over the top of your loop. You hit record and mess up the timing of the melody. Loop ruined, right? Fortunately, all loop station pedals allow you to undo the last overdub. This can be used to fix mistakes, but also useful for removing layers during a song. There’s also a Redo fuction to add the overdub back in. Unlimited overdubs: some looper pedals are limited with how many overdubs you can add to your loop. Unlimited overdubs mean you have the freedom to add to your loops as much as you like. This can be great when creating atmospheric soundscapes or complex rhythms. External footswitch support: the number of footswitches plays a big role in how flexible a looper can be. While there’s a lot you can do with one footswitch, adding an extra footswitch can make a big difference. Every loop station pedal has an input for an external footswitch. If you ever feel limited when controlling your loop station, try adding an external footswitch. 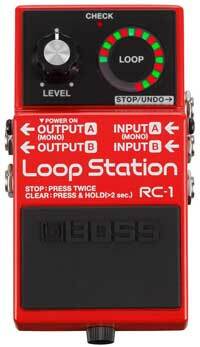 The RC-1 is the simplest and cheapest loop station pedal. If you’re looking for a simple looper and you don’t need the extra features in the other loop station models, this is a solid choice. The best feature of the RC-1, in my opinion, is the indicator ring. This gives you a great visual indication of the length of your loop and what the looper is currently doing. You don’t need to guess whether your looper is in recording/playback mode as each mode is displayed in a different way using green or red lights. This is something that is missing from other basic loopers such as the Ditto. Having one footswitch means you need to memorize how to control the loop. Fortunately, the RC-1 has the basic functions written on the pedal. 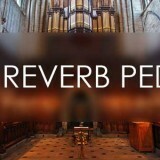 You tap the footswitch to start recording, then tap it again to enter into overdub mode. Tap the pedal again and it enters playback mode. Tapping the pedal again changes back and forth between overdub and playback mode. The default order of recording > overdub > playback can be changed as explained in the BOSS RC-1 manual here. You’re able to switch the order of the modes to suit your needs. If tap the footswitch twice, the loop stops. After stopping the loop, hold the footswitch down for longer than two seconds and the pedal will erase your loop. If you need to undo your last overdub, hold down the footswitch for two seconds during playback. If you want to add the overdub back in, hold down the footswitch again for longer than two seconds during playback. The stop/undo/redo functions can be controlled with an external footswitch if you need an easier way to control your loops during a live performance. BOSS created the RC-1 to compete against the incredibly popular Ditto Looper by TC Electronic (read my review of the Ditto here). The Ditto Looper became popular thanks to the low price and easy-to-use features. The RC-1 costs the same as the Ditto and adds some extra features missing on the Ditto. Both pedals make use of one footswitch and one level knob. The Ditto Looper is mono while the RC-3 supports mono or stereo inputs and outputs. If you use stereo pedals or plan on using them in the future, this is a great feature to have. The Ditto can record up to five minutes, while the RC-3 records up to 12 minutes in stereo. You’re unlikely to ever need to record a loop that long, so both pedals provide more than enough recording time. The main difference between the RC-1 and the Ditto is the indicator ring on the RC-1. It might not seem like much, but it makes the looper so much easier to use. Having a way to see exactly what is happening with your looper pedal is a great advantage. Who is the RC-1 for? As you can see, the RC-1 is a simple looper pedal. The compact size and simple features make it an excellent looper for anybody with simple looping needs. If you only need the ability to record simple loops and you’re happy to control the loop with one footswitch (or connect an external footswitch for more control), then the RC-1 will be perfectly fine for those needs. Check out the price and full details of the BOSS RC-1 here. The RC-3 keeps the same compact size as the RC-1, but steps up the features. You have a lot more control over your loops, ability to store recorded loops on the pedal, and mix in drum patterns. While the RC-1 gives you basic looping functions, it should be clear how much of a step up there is when you jump to the RC-3. The RC-3 is still a one-footswitch pedal, but the amount of features packed into the pedal is impressive. The main advantage to the RC-3 is the ability to save your recorded loops to the pedal. This is a fantastic way to quickly record song ideas and keep them for later. You can record different chord progressions and practice improvising over them and have them ready at every practice session. The ability to connect to a PC to import/export audio files is a handy feature. If you create a killer loop, you can save it and keep it on your PC. Or if you want to practice working on a riff, lick, or solo, you can import the audio clip to your pedal and practice playing over the loop. With 3 hours of recording time, you can even import entire backing tracks to the pedal. An issue a lot of beginners have when they first try a looper is with timing. Being able to accurately start and stop a loop at the right time can be tricky at first. The RC-3 has two modes to help you create better loops. The Automatic mode will begin recording as soon as you start playing. The Count-in mode gives you a bar of rhythm set at a tempo of your choice (using a tap tempo button) before it starts recording. These different recording modes can help you create the perfect loops. The rhythm patterns are also a great way to work on your timing skills and build up complex loops. Who is the RC-3 for? The RC-3 is for guitarists looking for a simple looper that has room to grow with them. 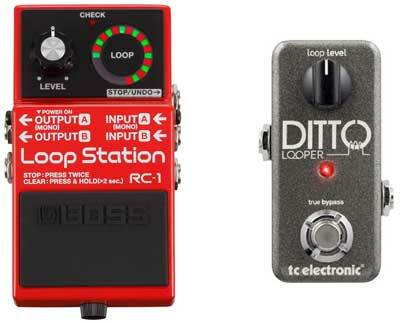 Basic loopers like the RC-1 or the Ditto can begin to feel limited after a while. It’s great to be able to jam along with basic loops, but there will be times when you want to take things further. The RC-3 doesn’t take up any extra space on your pedalboard while packing in a lot of features. The ability to save recordings to the pedal can give you a lot of ways to create and experiment with music. If you’re a live performer and you think you’ll experiment with adding loops to your playing, the RC-3 is a great starting point. You’re able to connect an external footswitch so if in the future you begin to feel limited by the one footswitch, you can easily expand it for more control. The Ditto X2 is a step up from the Ditto in the same way that the RC-3 is a step up from the RC-1. The Ditto X2 and the RC-3 cost around the same, so you might expect them to be similar in terms of features. In my opinion, the Ditto X2 falls far behind the RC-3. The RC-3 adds in useful features such as saving up to 99 loops and a rhythm player. These features make the RC-3 a worthwhile upgrade from the RC-1. The X2 only adds in two loop effects that most players aren’t going to use. How often are you likely to want to play your loop in reverse or at half speed? The X2 also allows you to import backing tracks, but it falls short of what the RC-3 can do. The only real advantage the Ditto X2 has is the two footswitches for independent start and stop functions. Apart from that, the RC-3 packs far more useful features in. I can’t imagine many situations where somebody would pick the Ditto X2 over the RC-3. 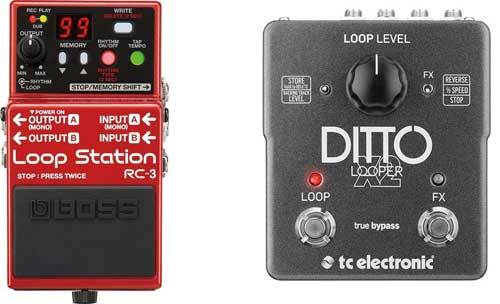 If you only need a simple looper pedal, you might feel a bit stuck between the RC-1 and RC-3. While there are a lot more features in the RC-3, it comes at a higher price. If the RC-3 is within your budget, I recommend choosing it over the RC-1. While the RC-1 is a great pedal, it’s bare bones compared to the RC-3. 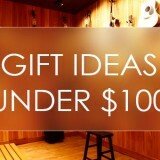 Being able to save up to 99 recordings on your pedal will be worth the extra price for most guitarists. Check out the price and full details of the RC-3 here. The RC-30 steps up the features again, but this time it also increases in size. I’ve already reviewed the RC-30 in full here, so I’ll stick to the basics in this comparison. 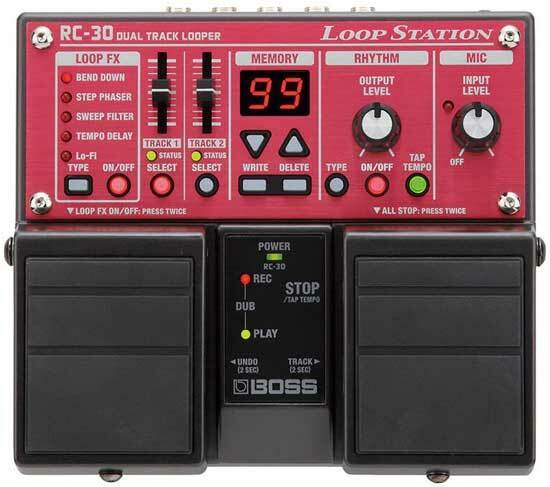 The BOSS RC-30 (link to Amazon for price) packs in a lot of features, so the easiest way to think of it is it gives you everything the RC-3 has, then gives you the ability to run two loopers at the same time. The RC-30 is possibly the most popular looper pedal of all time with live performers. More often than not, when you see a live performer creating loops, you’ll see an RC-30 on the pedalboard. It’s easy to see why when you consider how much control the RC-30 gives you. The fader sliders for each track allows you to dial in the perfect mix for different parts. The two footswitches give you plenty of control over creating and playing your loops. You still have the ability to connect an external footswitch, so you can have even more control over your loops if you need it. There are different modes (as I cover in my review) you can set for recording order. This allows you to set up the looper to suit your own needs. 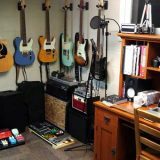 You’re even able to connect a microphone directly into the pedal with an XLR cable, which allows you to use the looper for acoustic guitar, vocals, or any other instrument using a microphone. The RC-30 also has inbuilt effects, which can be fun for a while, but most guitarists aren’t likely to use them. The main benefits to the RC-30 is the ability to save up to 99 loops and the control you have over every aspect of the loop. There’s clearly a big difference between the RC-3 and RC-30. 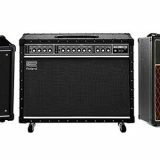 The RC-30 is also almost twice the price of the RC-3. So the big question for you is whether the extra control and features built into the RC-30 are worth it to you. Do you want to be able to run two synchronized loops or will one be enough for you? If you can’t think of any reason to run two loops at the same time, then the RC-3 may have everything you need. Buying an external footswitch to add to your RC-3 might give you enough control over your loop that you don’t need to consider the RC-30. On the other hand, if you’re a live performer and plan on heavily using loops in your performances, it’s worth considering the RC-30. Running two synchronized loops at the same time gives you a lot more freedom when building layers and starting/stopping parts. With the RC-30, you’re able to easily create a verse/chorus style song with the two loops. You can even use one loop track for guitar parts and the other loop track for vocals. Check out the price and full details of the RC-30 here. 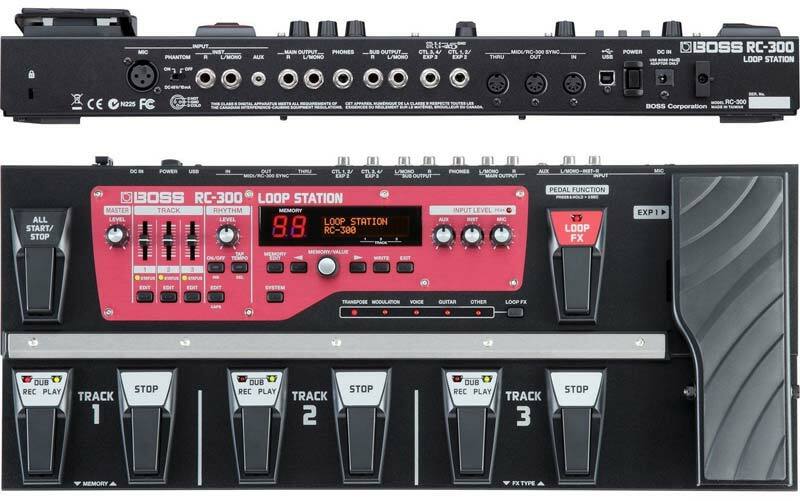 The RC-300 is the top-of-the-line looper from BOSS and it’s an absolute beast. As big as a typical multi-effects floorboard, it gives you complete control over your loops. There is a lot we could talk about with the RC-300, so let’s stick to the basics to give you a general idea of what it would be like to use. Three loop tracks: The RC-30 has two loop tracks. The RC-300 steps this up to three loop tracks. Each track has two dedicated footswitches. Remember that each track gives you unlimited overdubs, undo/redo, start/stop, etc. There’s also a level slider for each track so you can mix the loops as you see fit. The way to think about this is you can build a dedicated loop for different parts of a song, different instruments, or different layers you want to start and stop without interrupting the rest of the music. You could have one track for percussions, one for guitar parts, and one for vocals or guitar melodies. Then you’re able to add to each loop as you see fit or stop them when needed. Expression pedal: the expression pedal can be assigned to control a lot of different parameters. The most popular use according to what I see from RC-300 users online is for level control of a track. You’re able to fade a track in or out as you see fit instead of only being able to start/stop the track with the footswitch. You’re able to connect up to two more expression pedals, so if you feel you need control over more than one parameter at a time, you can expand the control. MIDI control: when you get to this level of looping, you’re probably going to want MIDI. MIDI gives you an easy way to sync up multiple pedals and instruments. For example, let’s say you have a delay pedal and you want the timing of the delay to match your loops. If your delay pedal is MIDI compatible, you can easily sync it with the RC-300 (the RC-30 also supports MIDI). I’m guessing a lot of guitarists will take one look at the RC-300 and feel completely overwhelmed. It’s an intimidating ‘pedal’ at first glance. It crams in a lot of control, but when you break it down to it’s simplest components, it’s manageable. You have three loop tracks you can use and are able to customize your pedal as you see fit. The way to decide between the RC-30 and the RC-300 is to look at how complex your loops will be and how much control you need. Will two loop tracks be enough for what you want to create? Or do you need that extra track? How much control do you need and how easily do you want to be able to start/stop tracks? The RC-300 has dedicated start/record and stop footswitches, so if you want to make performances as easy as possible, it’s a nice step-up from the RC-30. The RC-300 is quite a jump up in price over the RC-30, so take a look at what you’ll be creating with your loops and whether it’s worth the extra money or not. Check out the price and full details of the RC-300 here. If you’ve read through each of the above pedals, you should have a good idea which one suits you the best. There’s a big difference between each Loop Station pedal, so for most guitarists, the choice will be easy. If you’re stuck choosing between two pedals (eg: between RC-3 and RC-30), I recommend the higher model (eg: RC-30). Even if you might be happy with the lower model today, in a few years you might start to feel limited by it. At some point, you’re going to think about the features of the higher model pedal and regret not choosing it. There have been times in the past when I bought a lower model pedal to save some money, only to regret it later on. I’ve never bought a more expensive model and wished I had fewer features. Get a looper that you’re not going to outgrow in the next few years. As an example, while the Ditto looper is incredibly popular and a great pedal, it’s incredibly basic. A lot of guitarists enjoy using it for a while, then start noticing it’s limitations. You want your looper pedal to last you a long time, so choose one that you’re not going to outgrow. How to use a looper pedal – this lesson gives you some simple exercises to get you used to looping. Even beginners can start using a looper pedal to create simple jam tracks and practice parts. Give these exercises a go when you get your first looper pedal. Best Looper Pedals – this guide gives you alternatives to the BOSS Loop Stations compared above. While one of the above looper pedals will likely fit your needs, there are plenty of alternatives out there. Check out the guide to learn more about looper pedals and other options.